God was moving in my heart in ways I didn't yet understand. It was a stirring, a longing. It was at a ladies' tea in December 2006. One year later, almost to the day, I knew He had been preparing me for the opportunity that seemingly dropped in my lap. He wanted me to purchase a tea shop that was closing and run an online tea business. As silly as it may sound it was the most faith-building experience I'd ever had. I had no money to start a business. I had no experience running my own business. I had no experience with tea. I did not let that stop me. My faith kicked into overdrive. I stepped onto every stone He put before me. All my previous jobs had given me the experience to start and run the business. Since the ladies' tea in 2006 I had become a student of tea, therefore, I had a lot of crucial information already. Our church had an auction recently and I wanted to contribute something, so I auctioned off a tea party for eight and a “How to Host a Tea Party” class. I wasn’t in town for the auction, so I didn’t know if someone purchased it, but a week later I received a call. The winner had not only purchased the tea party but had been determined to win the bid. She said she was bringing two groups of friends together who had not previously met, so she had my full attention since bringing people together is one of my favorite things. Her excitement was contagious. It didn’t take long for the Lord to begin speaking to me about this party and these women. I auctioned off a tea party, but He had plans for so much more. She picked the menu and gave me the freedom to talk about tea or not. As I prepared Friday I was near tears as the Lord was so specific about the plates and cups and these women He adored. He wanted them to know how uniquely He had created each one of them, He instructed me to choose my most uniquely shaped teacups. When God speaks to me so specifically, so lovingly about others it reminds me He is no respecter of persons and does the same for me. Saturday was the tea party. As is always the case with a tea party or a tea class I walk away in awe of how God shows up. These women didn’t seem like strangers at all, they felt more like long lost sisters. The hostess had air plants at their places for them to take home and a friend and I had painted pictures for each of them. I heard more than once, "This means more than you know." I know how our hearts need to hear Him whisper something specific to our heart. 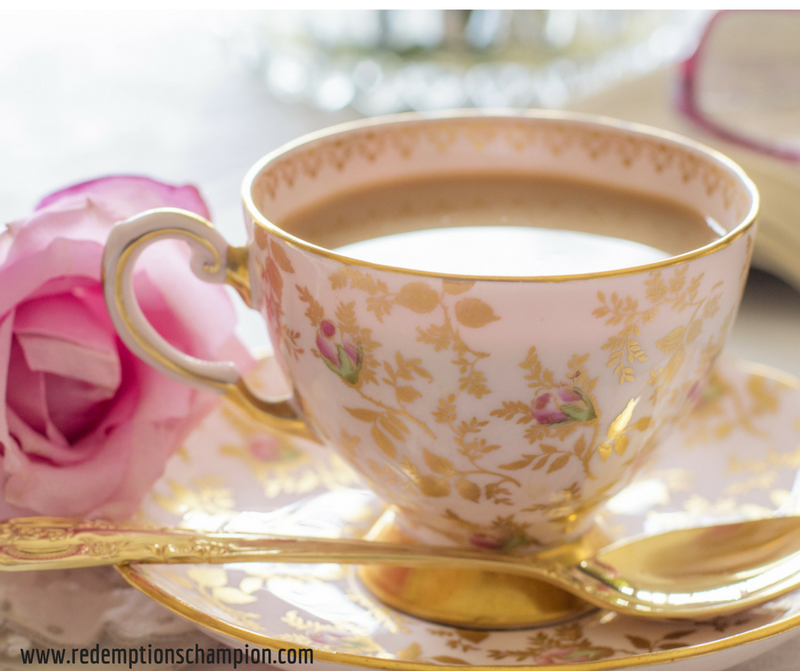 You see God loves a tea party, but He loves His daughters even more. A tea business may not seem like a big deal and in many ways, it wasn’t, but in the ways that matter it was the best thing I’ve ever done. God continues to use my obedience and willingness all those years ago to open doors for me to share His love, His love for His daughters - that is always a humbling and awe-inspiring experience. What has He called you to do? It may not be what you want or what you thought, but maybe, just maybe it is the next step in getting closer to His perfect plan for your life. This year has been tough for me. The party several years I had the privilege I'd teaching ladies bible studies in my home. I had been asked to teach a group of 10 years old, and it was awesome! I was am awana leader, Room mom,etc. I finally had felt of value. Well, all that came to a stop (long story short). I heard God tell me to focus on my 5. It was tough for me! I am so glad I obeyed because I was missing so much! I didn't think it would be possible for a mom that involved With children to miss anything. But, I can thank him now for the things I have noticed. For the fact that I do have value, in whatever I do. I am not more valuable With a title. I am a child of God and I am called to do whatever I am doing, work as if I am writing for God, not man. In this tinge of patiently waiting,my girls are thriving. My marriage is going to succeed and my son is watching a God gearing mother, obey the Lord. It is a great season. Mispelled or not, well said! Glad God brought us together in this season. Love doing this faith walk with you! Now onto our BRAVE new adventure.